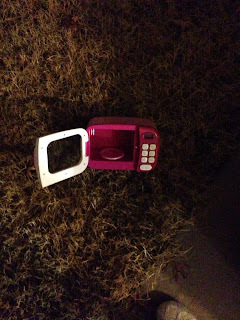 Why, you might ask, is this pink toy microwave sitting askew on my lawn? There was a worm inside of it. Okay, maybe it wasn’t a worm. Maybe it was a caterpillar. Still. Ew. And I’m sorry, I don’t trust things that don't have feet that I can clearly see. After I put Natalie to bed I noticed the microwave sitting on the patio and I assumed she forgot to bring it in. It had been raining and I didn’t want it getting ruined because I could only imagine the drama that would bring if it no longer worked. The microwave door was opened a bit and when I went to pick it up, that’s when I saw the black beady eyes of the caterpillar. I did what any other self respecting adult would do in that situation: I tossed the microwave in the air and screamed like Macaulay Culkin. There are no pictures of the caterpillar as it was tossed somewhere in the yard when I tossed the microwave. I did not break the microwave since it landed in the grass, thank goodness. And that’s when it dawned on me that its home was the pink microwave. I told Natalie that Princess had turned into a butterfly and flown away and that she wanted me to tell her thank you for her hospitality. I did not tell her that Princess probably died due to a brain trauma from being thrown across a yard. I did tell her that keeping insects in the microwave was not nice, as they needed to eat and, you know, breathe. Will she listen to me? I’m not sure. But in the future if I see a toy with a door/trap/closure outside, I’ll head over to it with caution. And yes I’m well aware that I’m a wimp. Awww.. you did what any self-respecting mom would do. What a great story. Found you on SITS. Turned into a butterfly, eh? Wow, you are fast to come up with a response, lol. Very cute story. My son is an avid bug collector so we end up with some kind of insect always in the freezer prior to making it's way to his display cases. Just a word, Cicada Killers are HUGE and scary and the husband had to deal with that one. Even frozen! I can't look at a caterpillar directly...they creep me out. Centipedes are worse....ew. That'd be my kid. He's always naming, catching, or having pets as wierd random things. HAHAHA! I love it! Good for you coming up with the butterfly response so quick - I would have had a deer in the headlights look. Ha, I would have done the same thing! I don't touch bugs. I'm sorry for the loss of Princess, but you did the right thing! I wish my daughter collected catipillars... Somehow I seem to end up with spiders instead. I love that she named the caterpillar 'Princess'. Seriously though, I hate bugs that have a million legs like that. Bahaha! So freaking funny. Caterpillars are creepy. A caterpillar in an unexpected place would have scared me too! Hmm, nobody comes running when I scream either unless I say, "Somebody help me!!" Good job on the butterfly story. Gross. I would have done the same thing. I screamed the place down when a moth flew in my window the other night, no one came to see what was happening. I'm now afraid to bring the laundry in from the balcony at night in case another one appears, it just as to sit out there until I can get it in daylight. lol your a trip, my son and I go worm hunting during the rainy months and grab them and gather them in a bucket haha - to each their own. I am terrified as worms. I would have done the same thing! Thanks for visiting me from SITS! That is cool. Maybe Princess found a Prince - lol.